Ask the Arborist: Do Trees Sunburn? | CS Tree Services, Inc. Question: I’m starting to notice discolored wood on some of my trees, and some of the bark is even decaying. After Googling the symptoms, I learned that trees can apparently suffer from sunburn! We do live in a warm area, but is this a very common problem? I didn’t know that this was possible! 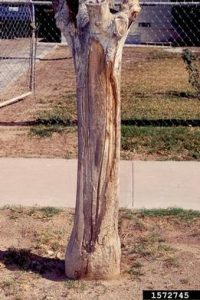 Ask the Arborist: As incredulous as it sounds, trees and woody plants can be exposed to too much sun and heat, and as a result will sustain wood damaging injuries. A damaged tree is unhealthy, and can possibly grow to become a dangerous tree. What Causes Sunburn on Trees? Injury from sunburn is caused by excessive solar radiation on aboveground plant parts such as leaves, bark, flowers and fruit. Direct radiation exposure from the sun can generate critically high temperatures in plant tissues, leading to dehydration and death. Prevention is much more effective than treatment. But once you see the damage, it’s usually too late for preemptive approaches. Plant only tree and shrub species that are well adapted to the site where they are planted. Provide plants with proper cultural care, especially appropriate water. Avoid removing more than about 20% of the plant canopy in 1 year. Whitewash trunks of young trees and the older bark newly exposed to the sun. Tree wrap products, plastic or cloth coverings that fit around a tree trunk also work well. Avoid changing the environment in any way that significantly alters the amount of light received by established plants, except purposefully to remedy inappropriate light conditions. If possible, reduce temperatures in the plant environment. Add shade, improve air circulation, and increase humidity. If soil moisture levels are low, irrigate then add mulch to retain soil moisture. Sunlight is necessary for all plants to grow and develop. But too much of a good thing in the wrong place can cause a lot of problem. Be a part of the solution instead of the problem by knowing the particular needs of the plant and providing for them in a timely manner.